The lemonpeel angelfish is one of the most gorgeous dwarf angelfish that you may find in a saltwater aquarium. With its beautifully composed color combination, it draws attention to any aquarium. A small-sized angelfish, it is often referred to as a dwarf or pygmy angelfish. These fish are found in the Indo-Pacific region, but several of these fish have been reported to inhabit the reef in Kaneohe Bay on Oahu, Hawaii. Not an endemic species to the Hawaiian Islands, it is believed that the presence of Hawaiian angelfish in Hawaii is due to the illegal release of unwanted aquarium pets into nearshore waters. This angelfish is often misidentified as the herald's angelfish (C. heraldi). However, Centropyge flavissimus has a uniform chrome yellow body, a blue ring around the eye, and dark-blue edges on the vertical fins, while C. heraldi has a uniform chrome yellow body, often having a slightly orange tinge to it. Juvenile lemonpeel specimens have a large, black eyespot on the side of the body, which is often edged with blue. The lemonpeel angelfish prefers to live solitary and stays close to shelter. It can be aggressive toward other angelfish. Two males will fight to the death. It is possible to keep a male and female pair or even a trio (one male and two females) of lemonpeel angelfish in the same tank together, provided that it is a large aquarium with plenty of hiding places, and they are introduced into the aquarium at the same time. This species is well known for nipping and picking at large-polyped stony corals and tridacnid clam mantles. 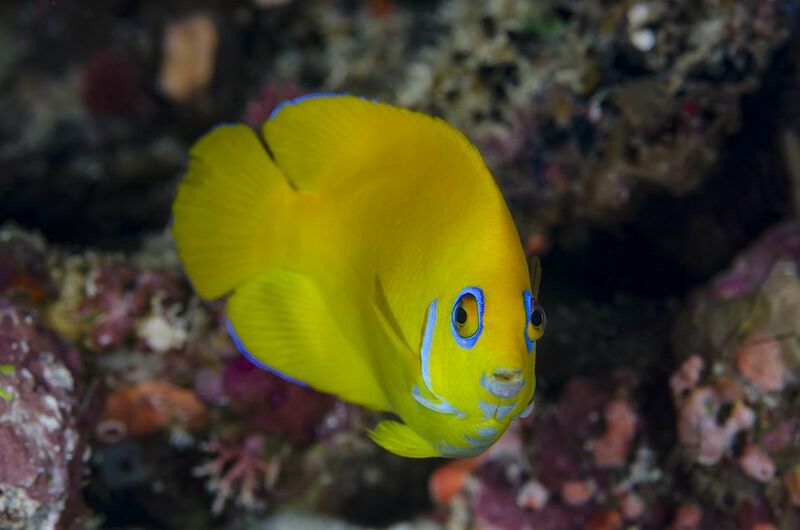 The lemonpeel angelfish may also eat some soft coral polyps as well as pick at zoanthids. Therefore this fish, as true with most all angelfish, cannot be completely trusted if these invertebrates are present. Dwarf angels are territorial and they will pick on less aggressive and smaller tank mates. Water quality and tank size are important for lemonpeel angelfish. A suitable tank size for a single specimen is a 30-gallon tank. A 55-gallon tank is a more appropriate size for a mated pair or a trio. They can do well in a typical reef setting, but may eat away at some of the reef structure. Make rock shelters in the tank that are suitable for hiding. The lemonpeel angelfish is moderately difficult to keep. Keep in mind these angelfish are constant grazers. Giving a lot of food equals a larger bioload in the tank, so water quality must be monitored. They need a pH of at least 8.0, and water changes that do not include scrubbing algae off of the rocks. If the tank is 55 to 60 gallons, a bi-weekly change of 10 percent to 15 percent would be good. If your tank is over 100 gallons, maybe every three weeks to a month do a 20 percent change, and so on. The aquarium needs to be at least 6 months old or more to provide all the necessary algae to feed your angelfish. The lemonpeel angelfish is an omnivore, but their diet mainly consists of algae. This is a type of angelfish that does not adapt as quickly to tank fed foods, which makes it a little more difficult to keep. It should only be introduced into an aquarium that is well established with ample live rock for grazing, or a good healthy population of macroalgae growth and diatoms to feed on. Providing this type of habitat stimulates the fish's natural eating habits, and with patience and coaxing it will usually begin accepting a variety of tank fed fares suitable for omnivores. When a fish sees other fish eating a certain food, quite often it will also start eating that food. Feed them two to three times a day and offer a variety of foods. You can feed them prepared foods with marine algae, spirulina-enriched foods, mysis shrimp, shaved shrimp, and brine shrimp. All angelfish are born as female. As they grow, the larger and more dominant fish will become male and if the male dies, the angelfish next in line in the hierarchy will turn to male. Putting a larger and smaller fish together is the best way to get a pair, possibly in about two to three months time. Be mindful and watch for aggression during this time. In the wild, like many other marine organisms, they reproduce by external fertilization. They are pelagic, or egg scatterers. They release eggs and sperm simultaneously at dusk. They dance, then rise into the water column and release their eggs and sperm near the top of the water. Lemonpeel angelfish are very difficult to successfully breed in captivity. They prefer warmer water, especially when spawning, requiring excellent water quality, and then a good food for the larvae. A larger, deep tank is needed, as well as a stable lighting schedule to encourage spawning. You can copy nature’s dusk light cycle by having half of the lights go out (brighter lights) then, an hour later, the other half go out at a consistent time every day. They need a temperature of 79 to 83 F for 14 to 16 hours a day and at least a 20-inch tank height to allow for the rising and spawning behavior. The eggs will hatch in just under 24 hours, and after hatching, within 24 to 36 hours they need microscopic algae for their very small mouths. Since raising babies are difficult, much preparation is needed. The larvae react to only certain kinds of live foods. It has been found that they won't eat rotifers. Baby brine shrimp are simply too big for them. But, they may eat copepods.